Get your “happily ever after” for your Midland home with roofing contractors who care about your long-term satisfaction. There once was a fairy tale that told of homeowners in Midland, Ontario finding roofing contractors who had competitive prices, quality workmanship, and did everything they claimed they would do. If you have believed that there is no reality in that expectation, you haven’t worked with us at Slippery Slope Roofing. We are like the Prince Charming and the “happily ever after” ending. You will find the entire experience from your first phone call through the completion of your roof installation, repair or replacement to be a dream come-true. 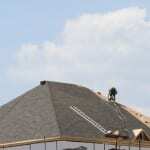 We believe that roofing contractors should have integrity and experience, and do right by their customers. Cutting corners on installation means the manufacturer may not honour the warranty, and that is completely unsatisfactory to us. We want to know that if there is a defect found during the warranty period, we can come take care of it for you without you then finding out that you aren’t covered. That doesn’t end well for anyone. By doing one job at a time, we make sure the quality standards are applied and that your job is done in a timely manner. Don’t settle for roofing contractors who are in cahoots with the Wicked Witch when you can have the happy ending you want and deserve. With more than 50 years of combined experience between our owner and foreman, you can be confident that we’ll exceed your expectations. Call us today with any questions you may have or to make an appointment to have your home’s roof assessed and get a no-obligation quote for any of our services.